The Wikco Industries, Motorcycle Spin Type Wheel Balancer is the perfect tool for small shops, clubs, and individuals that need an inexpensive, easy to use, wheel balancer for motorcycle wheels. 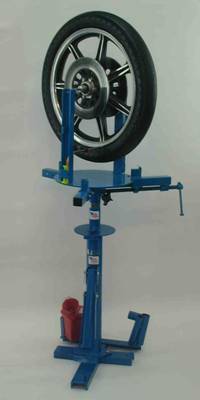 The Wikco Wheel Balancer fits most motorcycle wheels (motorcycles with shaft drive and/or single sided swing arms may need a special adapter which we can supply, see below). 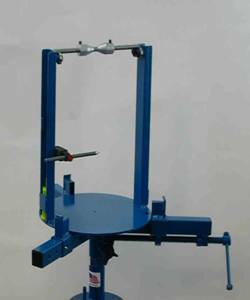 The unit can set on a table top or be clamped into the Wikco MC110.100 or the MC110.200 rim clamp motorcycle tire changers, or most other rim clamp motorcycle tire changers. This balancer has several unique features including a magnetic holder and guide rod to help you quickly and easily tell if your wheel is true. Also includes tire crayon to mark wheel, and 2 strips of Tape-A-Weight. 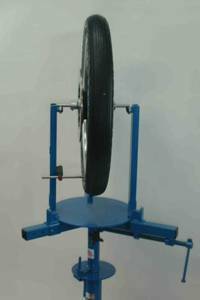 Wheel balancer is perfect for use by small shops, bike clubs, and individuals that want to be able to balance motorcycle wheels easily; balances within 1/4 ounce. 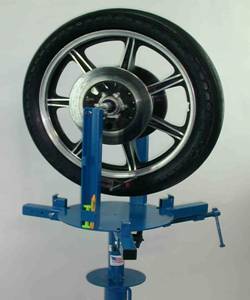 Model BMC112: Manual motorcycle wheel spin balancer accepts standard motorcycle wheels, shaft drive bikes and single sided swing arm bikes may require a custom adapter, see special offer below. Shipping weight is 32 lbs. Custom Wheel adapters are available when needed. Wheel cone, standard size that comes with balancer, maximum diameter 1.125 inches (1 1/8), minimum diameter .5 inches, length 1.125 inches. Wheel cone, one of pair that is used for Honda VFR models, maximum diameter 1.375 inches, minimum diameter .815 inches, length 1.75 inches. Wheel cone, one of pair that is used for Honda VFR models, maximum diameter 2.25 inches, minimum diameter 1.642 inches, length 1.75 inches. Wheel cone, for any rim with large hole in rim, has 2.25 inch hole minimum, with 0.50 wide step, then up to maximum diameter of 2.40 inches, total cone length is 1.75 inches. Price is $23.95 per cone Plus Shipping.